The Official Podcast of MLSReserves.com. A Goat filled episode as three members of Chivas USA lend their time. 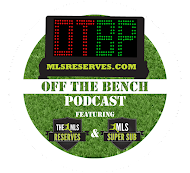 Danny Califf talks about his departure from the Philadelphia Union, Dan Kennedy discusses his season and Juan Pablo Angel talks of his work with Juan Agudelo. Greg Lalas, Editor-In-Chief of MLSSoccer.com joins to talk about the challenges of managing new media and being owned by MLS. Also Celine Dion. Yep.